At Grandy’s®, we serve more than just food. We serve people. And we have been since our doors opened in 1972. We’re not just another fast casual restaurant, turning out mass-produced food at breakneck speed. Our food means something, both to us and to our loyal customers. There’s something about that Country Fried Steak your grandma used to make for Sunday dinner. Each and every bite tastes like home. 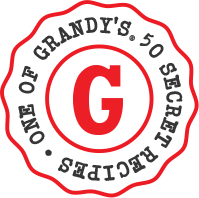 Grandy’s began over forty-five years ago striving to make sure that same feeling comes through with every meal we prepare and serve. We’re still striving today. With more than forty-five locations spread across the US, we’re glad to share our passion for delicious, lick-your-fingers homestyle goodness with everyone who loves real, no-nonsense comfort food. From our warm, sticky-sweet Sinnamon® Rolls, delectable Country Fried Steak, Savory Pot Roast, Famous Buttery Rolls, all the classics at breakfast and more delicious sides than you can shake a stick at, Grandy’s has the secret homestyle recipes that not only fill people up but feed people’s souls.